Home / If you want to be a foster carer, just go for it! Born and brought up in Craigmillar, former bus driver Craig had always wanted to be a foster carer. In our latest blog post, he talks about his change of career to fostering and how it has transformed his life. “My first career was as a bus driver in Edinburgh. I’ve always been interested in fostering but I didn’t think that gay people could foster, so I hadn’t taken things further. I was bringing my son up on my own as, at the time – his mother wasn’t able to look after him. I worked as a bus driver to pay my mortgage. …my son always came first so this was very important. However, when my son got older I needed a challenge. After 20 years as a bus driver, I was bored. One day, as I was driving along Princes Street, I saw ad after ad on the bus shelters about fostering. The ads said that you didn’t have to be married to foster, you could be gay, black, divorced, single….etc to foster. That was the turning point in my life. I knew I had done a good job with my son and I could do the same for a foster child. Initially, I became a foster carer with a private agency but, after a few years, I transferred to Foster with Edinburgh. I haven’t looked back since. It was a massive change. The support you get with Edinburgh is invaluable. There are also carer groups during the day that you can go to to share experiences and support each other. These are great. With Edinburgh, placements are available when you need them so you aren’t waiting for long periods in between. To date, with the support of my partner George, I have fostered 15 children. They have all been very different but they all need to be given a chance, so it’s important to be on their wavelength. I can think of one child in particular that no one wanted to take because he was quite wild. Within a couple of days, he had calmed down and I was able to help him. I was really touched when he thanked me when it came time for him to leave. When children are able to go back home, it’s so rewarding to think that you have played a part in this. One thing I like about fostering is the mixture and variety. I do emergency, permanent and respite fostering, so there’s always something happening. The other children get excited when we have a new foster child coming and I like to get them all involved. Holidays and weekends are nice and busy, which I like. The children help plan positive experiences during holidays such as Xmas and we all go on holiday together. I would recommend anyone who’s thinking about fostering not to put it off for years and years like I did. 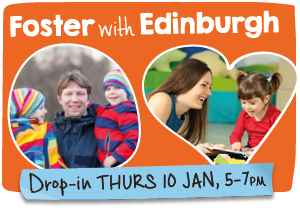 Go along to one of the Foster with Edinburgh open sessions. When I went, I had lots of questions. They answered them all, and being able to listen and speak to someone who is a carer is really helpful. The atmosphere is great. Find out about fostering with us.